FEM = assembleFEMatrices(model) returns a structural array containing finite element matrices. Model attributes, such as coefficients, material properties, boundary conditions, and so on, must not depend on time or solution. 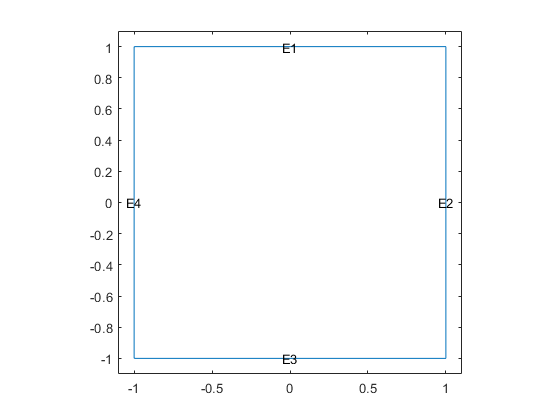 FEM = assembleFEMatrices(model,bcmethod) assembles finite element matrices and imposes boundary conditions using the method specified by bcmethod. Create a PDE model for the Poisson equation on an L-shaped membrane with zero Dirichlet boundary conditions. Generate a mesh and obtain the default finite element matrices for the problem and mesh. Generate a mesh and obtain the nullspace finite element matrices for the problem and mesh. Obtain the solution to the PDE. Compare this result to the solution given by solvepde. The two solutions are identical. Assemble the intermediate finite element matrices for a thermal problem. Create a transient thermal model and include the geometry of the built-in function squareg. Plot the geometry with the edge labels. Specify the thermal conductivity, mass density, and specific heat of the material. Set the boundary and initial conditions. Generate a mesh and obtain the default finite element matrices. Method for including boundary conditions, specified as 'none', 'nullspace', or 'stiff-spring'. For more information, see Algorithms. If the value is 'none', then the fields are K, A, F, Q, G, H, R, and M.
If the value is 'nullspace', then the fields are Kc, Fc, B, ud, and M.
If the value is 'stiff-spring', then the fields are Ks, Fs, and M.
For more information, see Algorithms. The mass matrix M is nonzero when the model is time-dependent. By using this matrix, you can solve a model with Rayleigh damping. For an example, see Dynamics of Damped Cantilever Beam. For a thermal model, the m and a coefficients are zeros. The thermal conductivity maps to the c coefficient. The product of the mass density and the specific heat maps to the d coefficient. The internal heat source maps to the f coefficient. For a structural model, the a coefficient is zero. The Young's modulus and Poisson's ratio map to the c coefficient. The mass density maps to the m coefficient. The body loads map to the f coefficient. When you specify the damping model by using the Rayleigh damping parameters Alpha and Beta, the discretized damping matrix C is computed by using the mass matrix M and the stiffness matrix K as C = Alpha*M+Beta*K.
K is the stiffness matrix, the integral of the c coefficient against the basis functions. M is the mass matrix, the integral of the m or d coefficient against the basis functions. A is the integral of the a coefficient against the basis functions. F is the integral of the f coefficient against the basis functions. Q is the integral of the q boundary condition against the basis functions. G is the integral of the g boundary condition against the basis functions. The H and R matrices come directly from the Dirichlet conditions and the mesh. Given these matrices, the 'nullspace' technique generates the combined finite element matrices [Kc,Fc,B,ud] as follows. The combined stiffness matrix is for the reduced linear system Kc = K + M + Q. The corresponding combined load vector is Fc = F + G. The B matrix spans the null space of the columns of H (the Dirichlet condition matrix representing hu = r). The R vector represents the Dirichlet conditions in Hu = R. The ud vector represents the boundary condition solutions for the Dirichlet conditions. u = B*(Kc\Fc) + ud. Internally, for time-independent problems, solvepde uses the 'nullspace' technique, and calculates solutions using u = B*(Kc\Fc) + ud. The 'stiff-spring' technique returns a matrix Ks and a vector Fs that together represent a different type of combined finite element matrices. The approximate solution u is u = Ks\Fs. Compared to the 'nullspace' technique, the 'stiff-spring' technique generates matrices more quickly, but generally gives less accurate solutions.